Teaching yoga to children and youth is a truly special experience. Working with children through yoga creates powerful links to their worlds, realities, and their mental openness. It is an opportunity to better understand what children experience as they develop. This course gives teachers the tools they need to accompany children most effectively as they grow. Yoga gives children tools to express their potential and talents for a positive future in line with their natural inclinations. The Altanon Hostel is located at the foot of the Dolomites, in the National Park area. It is an ideal place for a few days of relaxing in the natural environment and a starting point for numerous activities. It is possible to go for lovely walks or more demanding trekkings around the beautiful mountains that surround the Belluno Valley. Ostello-stilizzato. The area also provides original museums, didactic trails, and bike tours for different levels of preparation. The Hostel is equipped with comfortable bedrooms (one or more beds each) and two wide, bright mansards, ideal for accommodating courses, meetings, workshops, and small congresses. The services Yogajoya offer to guests ranging from simple b&b, half or full bored treatments. The attentive care of the catering, based on the use of local and seasonal products, as well as the courtesy of the managers and the enchantment of the place, will surely make your break pleasant and your holiday enjoyable! Upon completion of this yoga teacher training, students will receive certificate affiliated with Yogajoya. Registration with Yogajoya meets identified standard set by the organization. Yoga provides benefits to adults in numerous areas. It is for this reason that yoga’s popularity is constantly increasing, and it is so widely practiced in today’s world. Equally, yoga can assume an important role for children and youth, ensuring optimum support for development of healthy and balanced persons in physical, emotional, and mental spheres. Introducing yoga to children and adolescents should not be under-evaluated. On the contrary, it should be considered seriously. This course is open to yoga teachers, school teachers, child care workers or anyone interested in deepening their understanding of child development and yoga. Throughout the duration of the course, the hours of the day are distributed between theoretical and practical lessons. The scope is to give future teachers a global vision of how to approach yoga with children from the first months of life through adolescence. The course teaches fundamental techniques of traditional yoga, such as asana (yoga postures), pranayama (breathing techniques), mantra, Omkar chant, yoga Nidra, and relaxation specifically adapted to the stages of child development. Games, visualisations, storytelling, Partner yoga, and other fun activities are planned. All activities are designed to fit with the principal aim of the course which is to spread yoga with its all traditions and its original meanings. In line with these traditions, the course works at the level of the body and its movement, but it is also infused with the yoga philosophy. Indeed, children and youth are whole persons, including body, mind, emotions, and spirit. Yogajoya considers the healthy and balanced development of all these aspects. Pointers are given for introducing entertaining and motivating activities into the classroom to keep participation high and ensure that boredom or dead moments don’t take hold. Yogajoya's courses encourage you to take an active role in your learning experience by taking chances and personally experimenting with the application of tools and techniques that you will be putting into practice with your own students. There is also something “therapeutic” about taking a leap backward, rediscovering your inner child and expressing yourself joyously, and naturally without fear. Your creativity will be stimulated and you will come away from each lesson full of positive energy. Teachers will finish the course with the ability to conduct lessons aimed at specific age groups. The methodologies presented and the techniques introduced are matched to the specificities of each stage of psycho-motor and personal development. The course includes a study manual with all material discussed. Individual feedback will be given to each student along with numerous other resources for teaching. Benefits, contraindications, and guidelines for teaching yoga to children and youth. Practical information for teaching to children including asanas (yoga postures), pranayama (breathing techniques), games, songs, partner poses, guided visualizations, stories, relaxation, and more. Coursebook contains detailed descriptions of all these components, their benefits, and how to use them in the classroom. How to teach yoga and create age-appropriate classes for children ranging from birth to age 16. How to make yoga fun and engaging for children of all ages. An introduction to yoga therapy for children with special needs including ADHD, autism, asthma, depression, and anxiety. How to bring yoga for children back to your home country or community and communicate with parents, schools, and administrators about the benefits of yoga for children. 22:00 Lights out and good night! 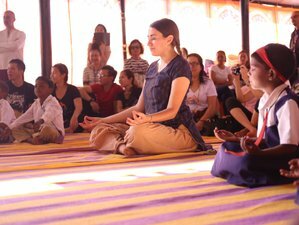 Andrea is originally from Connecticut, USA and she now travels back and forth between the US and India as a teacher trainer for the kids’ yoga TTCs. She is currently a graduate student at the University of West Georgia studying humanistic psychology. Her main areas of research include spirituality in children, yoga for educational settings, child development, and approaches to holistic teaching and learning. She started practicing yoga at the age of 12 as a supplement to her ballet training. Andrea has been teaching yoga for the past seven years and received her training in the US and India. This yoga teacher training will take place at Ostello Altanon in Belluno, Italy. A welcoming refuge made of stone and wood, placed in the green quiet of the forest, closeby the placid water of the Veses river, and a few kilometers far from Belluno and Feltre. Food is vegetarian made with fresh local products. Yogajoya will serve 3 meals a day and two tea break, one in the morning and one in the afternoon. The Italian cooking style will make you fall in love for each vegetarian dish. Everything will be delicious, healthy, as well as stable for yogi and yogini. You can walk around enjoying the powerful nature of Dolomite. During the free time, you can ask for a massage or Thai massage sessions. You can also experience teaching with kids. If you want to spend some more days between the Dolomites, you can go hiking, biking, trekking, and much much more! Please book your flight to arrive at Venice Marco Polo Airport (VCE). From Venice airport, there are several trains that are available direct to Santa-Giustina, Feltre train station. Once you reach the train station, Yogajoya will come to pick you up. Yogajoya offers internationally-certified yoga teacher training retreats in Italy and India to incorporate more joy in people's lives and to bring out the best in them. The course will host not more than 12 students and the request is always high! Do not lose this opportunity and book your spot as soon as is possible!